This is the first recipe I have really made on my own. Not like whip together make on my own but I actually took out a notebook (It has “PRIVATE” in multi-color on the front from my Harriet the Spy Halloween Costume and I thought…this is the perfect notebook to jot down recipes in). I wanted to prep for the week and chili is the prefect meal for this. The issue was that I was SICK of beef/pork. Sometimes, I just get weird about it and feel like I need more Chicken and Turkey in my stomach..so I winged together some delicious Turkey/Chicken Chili. In saucepan on medium heat, add your two tablespoons of coconut oil. Once that melts a bit add your onion and garlic. When your onions start to get soft, add in the meat and mix it up. Add some Salt and Pepper to taste! Once the meat is approximately 1/3 of the way done ( I eyeball this by some pieces are cooked and others aren’t, so some are faster than the others) Turn the pot on low and toss in your green pepper and mushrooms. Mix it up! Add the cans of tomatoes! Mix in all the spice, the green chili pepper and cover the pot up! I let mine sit for about an hour and fifteen minutes, stirring every 15 minutes or so. I have separation anxiety so I like to check on it a lot. When everything is blended, smells delicious and is done – eat! As seen in the picture above, I brought this in for lunch at work. 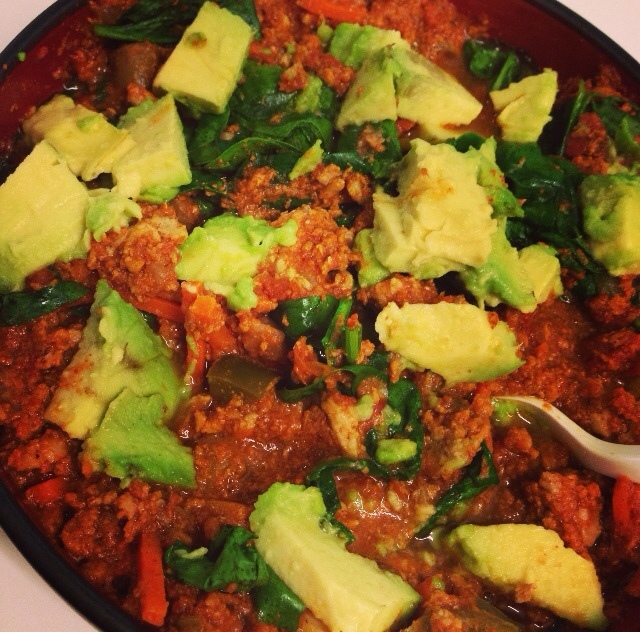 To make it more photogenic and a bit more than just chili (because chili for 3 days might get old) I tossed the chili on a bed of ripped spinach and topped with half an avocado diced. I typically make chili every few weeks and eat it during the week at work. Sometimes I add Whole Foods Plantain Chips to the game by dipping or breaking up a few on top. You can also add some Siracha or Cholula to it! This entry was posted in Dinner, Lunch and tagged chicken, chili, paleology, preparation, turkey. Bookmark the permalink.